1977 Gorham Sterling Santa's Helper Elf Unlimited Ornament. From Unlimited Collection Designed By Judy Lee. Following the tremendous success of their snowflake line, Gorham introduced their "Unlimited" series in 1972, with an annual offering of finely crafted sterling silver ornaments by the designer Lucien Sermon and others. Renowned jewelry designer Judy Lee created this charming fellow for Gorham in 1977. Titled Santa's Helper, this charming elf sports an apron with a pocket full of tools and carries a lovely Christmas tree ball ornament large enough to dwarf him. This RARELY found ornament is in brand new condition in the original pouch and box, but does NOT include the outer sleeve stamped 1352. There are absolutely no signs of use or polishing. It is appropriately marked on the flat back Gorham Sterling 1352. Standing 4 inches tall and 2 3/8 inches wide, this would make an impressive pendant also. A fantastic find for your Christmas ornament collection, a wonderful addition to the Judy Lee Jewelry collection, or a fabulous gift for the collector on your gift list. Thank you for your interest! If by some small chance your item is not satisfactory, your return should still be received within 7 days or less. Be sure to check my other listings for many Towle 12 Days of Christmas sterling pendant /medallion / ornament / charms, Gorham, Lunt and other sterling ornaments, and more great gift items, Victoriana, Elegant Glassware, Vintage Clothing and Shoes etc. 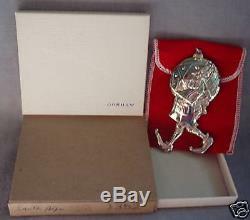 The item "NIB 1977 Gorham Sterling Santa's Helper Elf Judy Lee Ornament Pendant Medallion" is in sale since Monday, August 11, 2014.